QUINCY, Mass. — Ahold Delhaize USA’s Stop & Shop chain said on Wednesday that it will begin deploying driverless grocery vehicles this spring in the Greater Boston area. 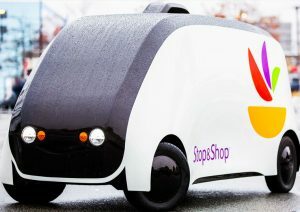 Unlike the self-driving delivery vehicles being tested by other retailers, which are designed to bring people’s pre-selected online orders to their homes, the ones being tested by Stop & Shop are designed to deliver a mobile shopping experience that will let people pick their own produce and other items. The Ahold Delhaize USA chain is working with Robomart Inc. on the program. Stop & Shop customers in the Boston area will be able to summon a Robomart vehicle with a smartphone app. When the vehicle arrivals, customers head outside and use the app to unlock the vehicle’s doors. They then choose the fruits, vegetables, and other products they would like to buy. When they are finished shopping, they simply close the doors and send the vehicle on its way. The vehicles’ RFID and computer vision technology automatically records what customers select to provide a checkout-free experience, and receipts are e-mailed within seconds. All Robomart vehicles are autonomous, electric and will be remotely piloted from a Robomart facility. 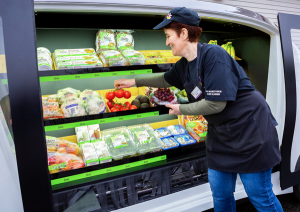 Throughout the journey, the teleoperated vehicles will be restocked with fresh Stop & Shop goods to ensure customers are provided with the best selection for purchase, the company said.